Officer Howard is a good, dedicated and courageous police officer – and he’s now a fast, powerful werewolf. As a monster, he can successfully engage other big monsters in claw-to-hand combat. 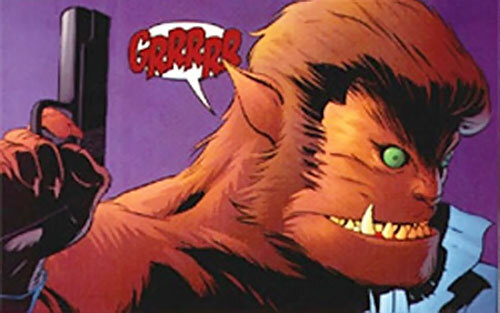 Since he wasn’t bitten by a normal werewolf, Howard does not appear to have the normal issues, such as bloody full moon rampages and vulnerability to silver. Roger Howard is the partner of Margo Vela – both uniformed officers of the Arcane Crime Units in the Devil’s Echo Police Dept. Howard was busy planning his marriage with his fiancée Mary when a new supernatural crisis erupted – classic Hammer Films creatures had been animated from a cinema screen and where on a rampage. Despite the assistance of the powerful occultist Lucas Falconer, the monsters proved to be invincible – no normal or occult countermeasure seemed to work on them. Falconer eventually understood the monster’s real nature, and got rid of them ; but despite this victory it was now necessary to deal not only with the wounded, but with people who had been bitten by ’the Count‘ (the Dracula figure) or ’the Howler‘ (the Werewolf figure). 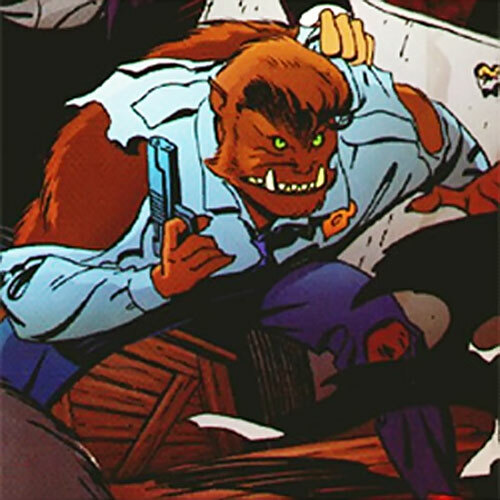 Among the victims of the Howler’s bites was officer Howard. At first glance it seemed too late to save him, since had already turned into a werewolf – but one who, surprisingly enough, was actually fighting on the side of his comrades. Using the standard procedure of emergency full blood transfusion, the victims of the Count were all saved from becoming vampires ; Falconer then started a ritual to heal victims of the Howler one by one. The ritual was both dangerous and exhausting for Falconer, and Howard insisted to be the last in line so as to save as many civilian as possible if Falconer collapsed from exhaustion before he could treat everyone. Falconer did manage to reach the last victim, Howard, but the ritual started going out of hand due to fatigue. 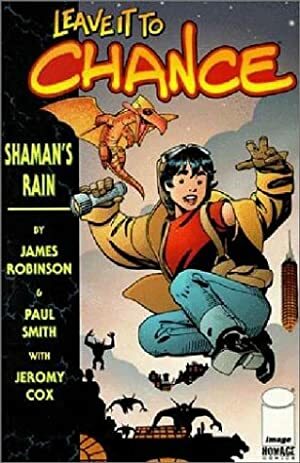 Fearing that Falconer would be killed in attempting to save him, Howard broke the spell – saving Falconer’s life but also remaining trapped in werewolf form forever. Due to his heroism, the chief of the ACU fought tooth and nail to retain Howard on his team despite his condition. Although Howard had great difficulties coming to terms with the end of his relationship with Mary (who could not handle him now being a monster), he seems to have completely overcome the bestial nature of his curse and is in full control of his abilities. 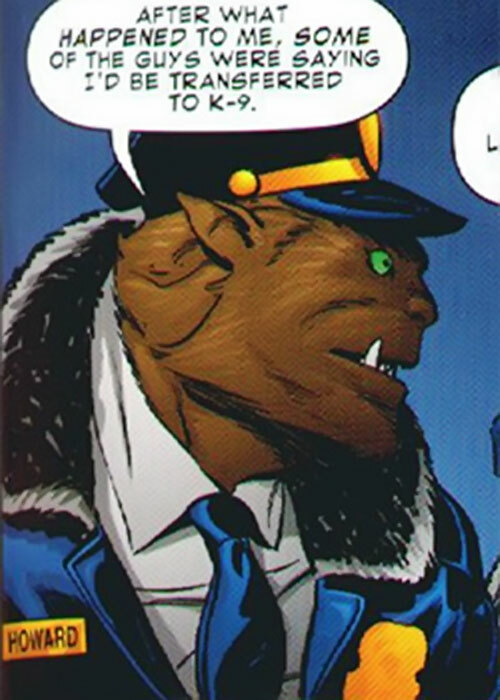 A werewolf wearing a police uniform. Howard is a good, dedicated cop. While he was previously the sensitive type, he’s now pretty gruff and prone to growling. He’s annoyed by the not-so-friendly jokes from some other cops about flea collars, but has to deal with it like any racism victim. He seems to be as focused and articulate as he was before – so he’s a tough cop who just happen to have a lot of fur and muscle. The Arcane Crimes Unit has access to various specialty munition, such as dual-purpose bullets (which contain both silver and wood, and are thus effective against both werewolves and vampires – although for the second you have to hit the heart) or water cannons loaded with holy water.